There will be no more Parasol Protectorate books. The thing is, Gentle Reader, I’ve never ended a series before. I’ve ended plenty of stories, somewhere in the vicinity of ten novels, and two masters thesis, but Timeless will be the first time I’ve ever completed an entire run of books. As it came time to finish Timeless, I realized I had no idea how to do this. So I did what any good scientist would do, gathered data, and researched how other people did it. Most of my favorite books are fantasies and space operas from the 1980s and 90s. Thank goodness these have endings. I can’t draw on urban fantasy because, while many of them are in series form, few have actually bothered to end yet. And there aren’t a lot of comedic books in self-contained series, so fantasy would have to be my model. Nevertheless, from what I could tell, regardless of fantasy, sci-fi, comedic, or alternate history, there seems to be two acceptable ways to end a series. Even if the books aren’t really romantic. This can be a reunion of long lost lovers, or a marriage of two we’ve been following all along, or simply an intimate moment between wife and husband after a long slog through many pages. 2. A Cute Moment of Character. By this I mean a character being, doing, or saying something pithy and totally within personality designed to leave the reader with a friendly feeling and a smile on her face. There is also the standard high fantasy poetical ending, but I didn’t really count this as I only found one or two stand alone novels that went with that approach. And really, can you imagine what a poetical ending for my books might be? and Ivy put on a hat like a spoon. I bet you want to know which approach I went with. I did spend some time considering the matter. I was inclined to go with neither. But would readers feel somehow betrayed by this? Is there an expectation of either option A or B? That is the question. In the end (pun intended) it happened quite naturally and I am really rather pleased with the final note of the book. 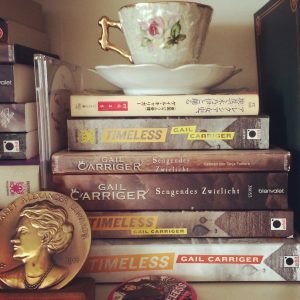 Timeless gets its first review. And quick on its heels comes the second. The hands that had hewn: turned to heal. And the Martlet made: his mansion in the eaves. Well, I don't want any spoilers, so I will be avoiding all reviews. I usually do anyway. I can decide what I like without someone else telling me if I will or not. And I love this series, so poo on reviews. Esp ones that have spoilers. I'm finishing another series now, Jim Butcher's Furies of Calderon, and I don't know if I am dreading it or excited, but I don't want it to end either. But all good things must come to one, I suppose. 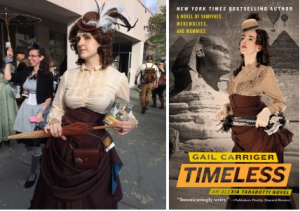 I was looking forward to reading Timeless anyway, but I'm especially excited to see how you wrap up a series now. This post made me so curious, and I'm also just fascinated as a writer — this is a conundrum I hope to one day approach myself. I am really going to miss Alexia and all rest. I do hope that there will be another series set in this same world in the not too distant future. The Finishing School (Feb 2013) is also set in the same world.